Liquid Pool Covers - Does your facility offer Scuba Diving Lessons? I was speaking with the Facilities Manager of a commercial aquatics facility earlier this week, and the topic of scuba driving training was brought up. He was interested in finding out if HeatsavrTM was safe for the equipment and suits of those training for their scuba license at his facility. The question itself wasn't surprising for me, but the phrasing caught me a bit off guard. When telling me about the activities at his facility, he said something to the extent of "and obviously scuba diving." Obviously? Prior to this conversation I knew that most scuba training courses were conducted at public facilities, of course, but I didn't realize it was so common as to be phrased as obvious. This got me thinking, and I decided it was probably a good idea to see if your facility does scuba diving training, and if you were ever concerned or interested in finding out whether or not HeatsavrTM is safe for use. If you don't offer lessons or let out your facility to local scuba diving schools, maybe this message will provide you with a new market to consider! If you do have this activity on your schedule, I'm happy to tell you that yes, it is absolutely safe to use our liquid pool covers. 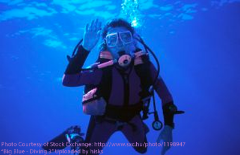 While slight amounts of our product may stay on the suits or equipment of the divers, it will not cause any problems, nor will it even be noticeable. It should rinse off easily, and if the suits are not rinsed, the product will simply biodegrade. Also, the amount of product that you may lose as the divers get out of the water will be so slight that it shouldn't make a difference in the effectiveness of the product. Using our liquid pool cover will still reduce the evaporation from your pool by up to 50%, continuing to save you heat, energy and water. If there are any other unique circumstances at your facility that you would like to ask me about, please feel welcome to get in touch with me any time. I'm always happy to help if I can!